Why can’t I recycle …. In this posting I’m going to explain why we can’t recycle a couple of items that we most commonly get asked about – and what the alternative uses are for these items. An example of "mixed plastics"
1. Our contractor (Veolia), who sorts and separates all the recyclable material for Lewisham Council stipulate that they want plastic bottles only. 2. There is a very limited market or demand for this kind of material, as it is of a poorer quality than the plastics used to make plastic bottles. 3. A small amount of mixed plastics are made out of the similar plastic to plastic bottles. But it is difficult for our collection crews to then identify if they cannot be recycled, as they would have to look for numbers on the bottom of all plastic packaging. By just accepting plastic bottles we make sure we receive the best quality plastic – and it makes it easier for residents to identify what can be recycled. We are still working with Veolia to find a consistent and stable market for mixed plastics. As soon as we do, we’ll let you know and start collecting them. We want to be able to collect as many materials as possible! 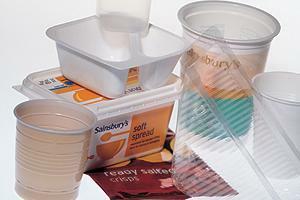 You can recycle mixed plastics at the Sainsburys in New Cross and at the Sava Centre in Sydenham, where they have specific mixed plastic bins. 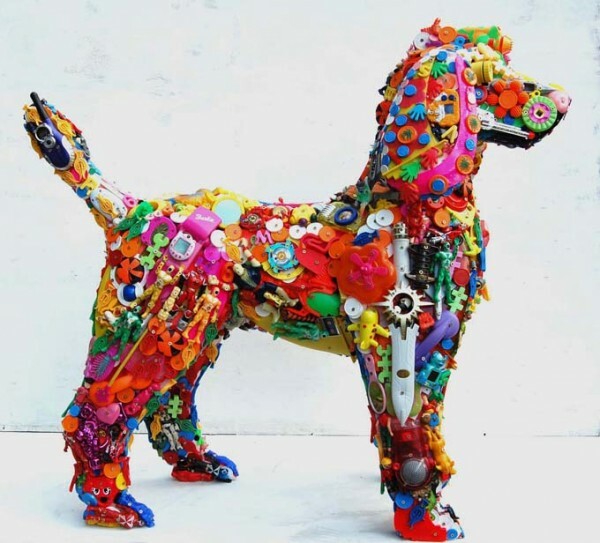 Alternatively you could make plastic dogs! The problem with recycling shredded paper is that the Material Recovery Facilities (MRF) that we use uses automatic sorting equipment to sort through the vast amount of recycling. The machine recognises many different types of material, but has difficulty distinguishing small or shredded paper. Because of the numerous processes that the material goes through, shredded paper often gets mixed up with crushed glass. This affects the quality of the glass which is produced as a result of this process. Shredded paper can also cause problems by jamming the machinery in the plant. Categories: Mixed Plastics, MRF, Paper, plastic bottles, recycling | Tags: composting, mixed plastics, MRF, plastic bottles, Recycling, shredded paper | Permalink. Why will Lewisham not provide residents with bins for re-cycling garden waste? When I phoned to ask this I was told that you had done a pilot scheme in a part of the borough (sadly not my part) and that people had abused the system so you were not going to introduce this form of re-cycling. How come Southwark (on the other side of the road I live on) and many other London boroughs can cope with the problems and Lewisham cannot? I cannot afford to buy Lewisham garden rubbish bags and I don’t have a car so I can’t take stuff to the dump. Until you address this aspect of re-cycling I don’t think you are offering a very comprehensive re-cycling service or delivering value for money to your residents. Could you please explain you justification for not offering this service. Unfortunately the garden waste scheme which you’re referring to was only a pilot, although the scheme was abused slightly this was not the main reason for not rolling out the scheme borough wide. As part of the evaluation of the pilot scheme it was deemed that rolling it out to the whole borough would be both financially and environmentally unviable. In terms of finances the cost of setting up and operating the scheme for the first year would have been £4.4m, this incuded the costs for new bins, vehicles and contract procurement. Operational costs year on year would have also been significant, including additional crews wages and treatment costs. In terms of the environment there are currently no facilities within a reasonable distance which would be capable of accepting and treating the amount of garden waste this scale of scheme would produce. Neighbouring boroughs either have facilities located in their borough or facilities where they can bulk the waste and transport it more efficiently to sites further away. Lewisham have neither and hence the emissions associated with transporting this waste would be considerable. Currently in Lewisham our refuse is disposed of within the borough and our recycling goes just over the border to the MRF in Greenwich. In order to provide residents with a viable alternative we offer free green waste drop-off sites, where you can take your garden waste to dispose off at the weekends, this gets taken to a site in swanley to be recycled. For more details on the scheme click here, and for a map of the four locations click here. As a council our main priority is Waste Minimisation in line with this we offer residents the option of receiving free compost bins and the chance to attend free compost workshops, environmentally this is by far the best option for dealing with garden waste, food waste and other compostable items such as shredded paper. Tetrapaks is something which we would like to be able to offer residents as part of the kerbside recycling. Unfortunately at the moment our MRF contractor Veolia are unable to accept them. As you point out they are easy to visually identify, however the majority of sorting at the plant is carried out by machines and the technology is not currently advanced enough to seperate them. Tetrapaks themselves are fairly difficult to reprocess as they are essentially a composite consisting of plastic, cardboard and sometimes film, which need to be seperated out. The recycling points around the borough where Tetrapaks are collected seperately are owned and maintained by Tetrapak themselves, they empty the sites and it is my understanding that they bulk the materials locally and then send them to Scandinavia for reprocessing at their own plant. We do hope in the very near future to be able to offer both tetrapaks and mixed plastics in the kerbside recycling collection. Shredding paper is essential especially for old documents. It can definitely be recycled – mixed in compost or made into certain shredded paper products for decor or use. 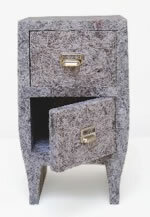 There are even some who collect shredded paper and make it into furniture. The possibilities are endless when it comes to shredded paper. We are more than happy to accept shredded paper in the recycling bins, but please feel free to compost the shredded paper if you have a compost bin. on. You’ve done an impressive process and our entire group shall be thankful to you.